Earlier this week, Oregon Public Broadcasting’s Think Out Loud devoted a program to a new (and, as almost every headline noted, “scathing”) audit of the state child welfare system, conducted by the Oregon Secretary of State’s office. The producers invited me onto the program to respond to comments from the state’s two top child welfare officials and the lead auditor. I was in a studio near Washington, D.C., so I couldn’t see the other guests. That’s why I’ll probably never know how they managed to fit all those guests and an elephant into one studio in Portland. 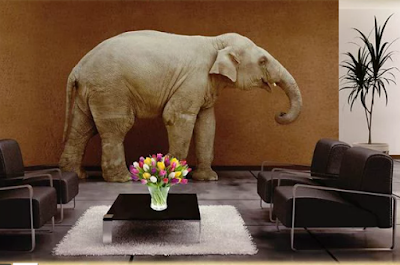 The elephant in the studio is, of course, Oregon’s obscenely high rates of tearing children from their families and trapping them in foster care. That elephant has been hanging around for decades – Oregon has been tearing apart families at rates far above the national average since at least the mid-1980s. Through all that time, the elephant has been ignored by the state Department of Human Services. And the behavior of the auditors is, if anything, even worse. The audit devotes exactly one sentence to the fact that Oregon is such an outlier when it comes to tearing apart families. 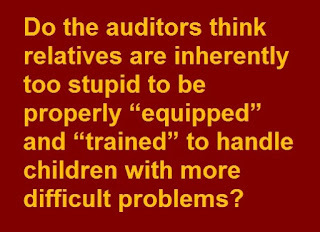 The lead auditor gave it a single sentence on Think Out Loud – and the sentence was shocking. She said she didn’t know if Oregon holding children in foster care at a rate she described as double the national average made the Oregon system “worse or better” than others. In fact, it’s not quite that bad. Oregon actually holds children in foster care at a rate about 60 percent above thenational average, not double. But the fact that the auditor thinks the rate is double and still doesn’t know whether that makes Oregon better or worse is that much more appalling. Listen to "What’s Wrong With Oregon’s Child Welfare Office?" on Spreaker. … it’s understandable that someone entirely new to child welfare issues would not know, at the very start of the audit, if an insane rate of removal is “better or worse.” But how can you go through months and months examining an agency and still not know by the end of the process? Did the audit team even ask why Oregon is such an outlier? Apparently not. ● Most cases are nothing like the horror stories. Far more common are cases in which family poverty is confused with “neglect.” Other cases fall between the extremes. Massive studies of typical cases show that children left in their own homes fare better in later life even than comparably-maltreated children placed in foster care. And a study of foster children in Oregon and Washington State showed that the foster care system churns out walking wounded four times out of five. ● All that harm occurs even when the foster home is a good one. The majority are. But study after study, including two from Oregon, found abuse in one-quarter to one-third of foster homes. The rate of abuse in group homes and institutions is even worse. ● All the time money and effort wasted on false allegations, cases in which family poverty is confused with neglect and needless foster care, as in this Oregon case and this one, is, in effect, stolen from finding children in real danger who really do need to be taken from their homes. So the implicit assumption behind the auditor’s ignorance – what she really was saying is: Maybe that high rate of removal makes children safer – is false. In all those months, the audit team never checked to find out. That makes the entire audit an exercise in willful ignorance. And it invalidates many of its conclusions. Much of the audit is built around the premise that there is a shortage of foster homes in Oregon. But if you don’t know why Oregon is taking away so many children, you don’t know if Oregon has too few foster parents, or too many foster children. So we get page after page about recruiting more foster parents. Worse, the audit calls for institutionalizing more children in so-called “residential treatment” – accepting as fact the claims of the residential treatment industry that this is the only option for children with serious behavioral problems. Similarly, the audit refers to DHS resorting to the very worst form of “care” opening up more parking place “shelters” as “potentially positive steps…” They express no concern at all that shelters are terrible for children. The qualifier “potentially” refers only to the fact that the shelter might not be enough to deal with the so-called “shortage” of foster parents. Why? 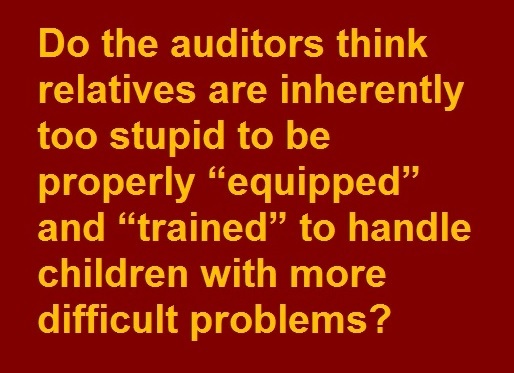 Do the auditors think relatives are inherently too stupid to be properly “equipped” and “trained”? And speaking of biases, just as only one sentence is devoted to Oregon’s high rate of tearing apart families, less than a sentence is devoted to the racial makeup of Oregon foster care. The audit notes that one-third of Oregon foster children are nonwhite. But that is mentioned only in the context of – as you’ve probably guessed by now -- the need to recruit more foster parents of color. The possibility that Oregon’s high rate of removal might be related to racial bias is not even considered. Even when the auditors are right, they fail to ask the obvious questions. ●The audit paints a picture of an agency so incompetent it can’t even produce an up-to-date organizational chart. It also confirms something some of us have long known: Oregon is where good ideas in child welfare go to die. But the audit doesn’t go back far enough – to the 1990s, when Oregon had a chance to reform its entire system along the lines pioneered by Alabama – and blew it. It’s not as if this information is hard to find – it’s all laid out in the epilogue to this Oregon Public Broadcasting / Salem Statesman Journal story. ●The audit discusses how badly DHS sometimes treats foster parents, and even how badly people in the agency sometimes treat each other. But it never asks the obvious question: DHS really needs foster parents, and it really needs its own employees. If this is how staff and foster parents are treated, how are they treating birth parents? But since the list of “stakeholders” the auditors spoke to includes virtually everyone with any connection to the system except birth parents who lost their children to that system, it’s not likely the auditors would think to ask that question. Given all that, it’s not surprising that the recommendations amount to nothing but more of the same: Recruit lots more foster parents and hire lots more caseworkers. But we already know exactly what that will produce: The same lousy system only bigger.